The United States House of Representatives has unanimously approved a key bill that aims to set the regulatory framework for self-driving vehicles. 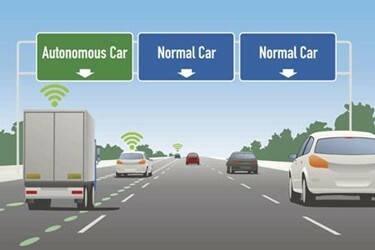 The House Energy and Commerce Committee voted 54-0 to pass the Safely Ensuring Lives Future Deployment and Research In Vehicle Evolution Act, or the SELF DRIVE Act, which defines the role of state and federal authorities in ensuring "the safety of highly automated vehicles as it relates to design, construction, and performance, by encouraging the testing and deployment of such vehicles." Government statistics reveal that, in 2016, an estimated 40,000 people were killed, 2.5 million injured, and over 6 million were involved in car accidents on U.S. highways, with roughly 94 percent of incidents attributable to human error. Energy and Commerce Committee members – who held over 250 meetings with car manufacturers, technology companies, government officials, and seniors and disability advocate groups, leading up to the affirmative vote – said that the rapidly evolving self-driving car industry has the potential to decrease traffic mishaps by up to 90 percent and save 30,000 lives annually. Under the SELF DRIVE Act, companies are required to submit safety assessment certifications or letters for highly automated vehicles, either deployed or in development, to the National Highway Traffic Safety Administration (NHTSA). The agency then is tasked with initiating, updating, or researching federal motor vehicle safety standards to account for advances in automated vehicle technology. Manufacturers, on the other hand, are entitled to apply for exemptions to these requirements for up to 100,000 autonomous vehicles on U.S. roads every year. These exemptions are designed to encourage automakers to ramp up testing and deployment to meet future demand for self-driving cars. "Our aim was to develop a regulatory structure that allows for industry to safely innovate with significant government oversight, as safety must be the chief priority. And I believe today’s legislation strikes that critical balance," said Rep. Greg Walden (R-OR), chairman of the Energy and Commerce Committee. The legislation also lays out additional requirements on cybersecurity, buyer information, and privacy plans for consumers using any automated driving system. According to the Washington Post, the bill also calls on the Department of Transportation to review regulations which define a car by reference to, for example, steering wheels and brake pedals – language that may conflict with some automakers that build cars without those features. In addition, the bill mandates NHTSA to establish a Highly Automated Vehicle Advisory Council composed of representatives from business, academia, government, engineers, and public safety advocates. The council will undertake data gathering activities, develop technical advice, and present best practices or recommendations on advancing mobility access for seniors and the disabled community using self-driving vehicles. It will also tackle issues on environmental impact, alternative fuel infrastructures, and consumer privacy issues. "With this legislation, we’re strengthening the promise of self-driving technology to improve the lives of millions of Americans who live with mobility and accessibility challenges," committee members said in a press release. “Self-driving vehicles offer an opportunity to significantly increase safety, improve transportation access for underserved communities, and transform how people, goods and services get from point A to B. The Coalition is grateful for the House Committee on Energy and Commerce's bipartisan leadership on the SELF DRIVE Act, and we look forward to working with members of the House and Senate to enact autonomous vehicle legislation that enhances safety, creates new mobility opportunities, and facilitates innovation." The U.S. Senate will have to pass a counterpart bill to the SELF DRIVE Act before it becomes law.